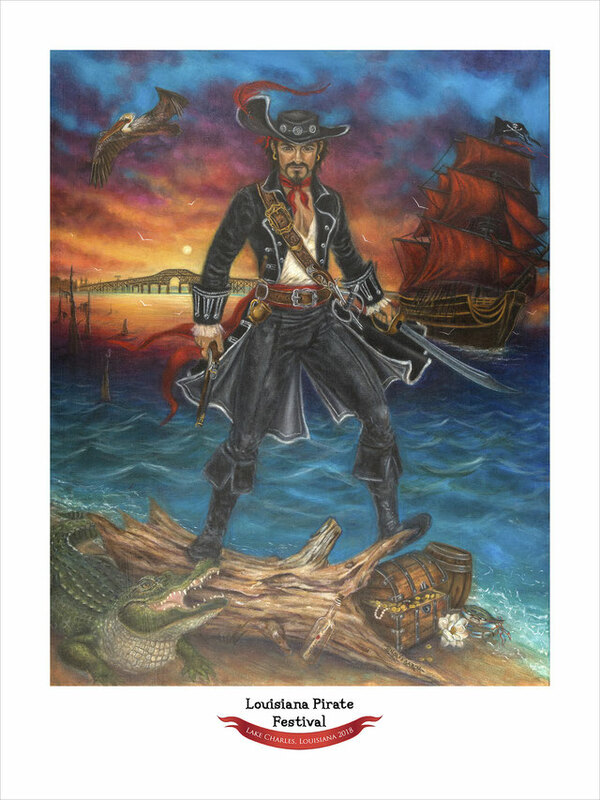 2018 PIRATE FESTIVAL POSTER - Louisiana Pirate Festival in Lake Charles! Jenga Garcia is a self-taught artist residing in DeRidder, LA. Her paintings have been collected by a diverse group of individuals locally, nationally, and internationally since 2005. She has participated in several group and solo exhibitions in several venues at home and abroad, including Altered Visions Gallery, JSG Gallery, Blue Star Arts Complex, La Bodega Gallery, Cactus Gallery, Argenta Arts District Core Gallery, and Penumbra Gallery, among others. Jenga's work has been in many newspaper articles and was also featured in “Imagine 2006,” an annual book showcasing the up and coming talent in fantasy art from all over the world. Her art has also been featured in Thrive's annual calendar and several card decks. She is a member of the prestigious Rabbit Hole Artist Collective, a group representing a collection of some of the world's finest fantasy artists. Jenga continues her artistic journey to explore and express her visions onto canvas.